Asking an author to pick her favorite book is a bit like asking a mom to pick her favorite child. An exception to the rule is my mother, because I’m obviously her favorite—but don’t get my sister and brother started on that one. 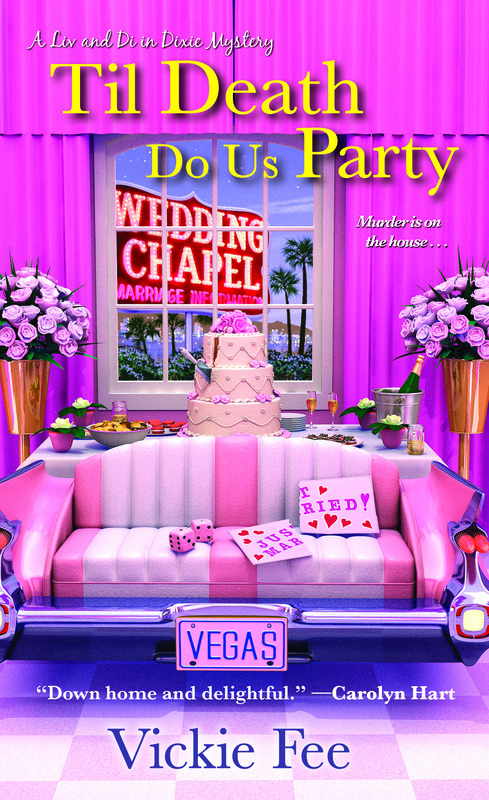 Another exception is the fourth book in my Liv & Di in Dixie cozy series, TIL DEATH DO US PARTY, which comes out in less than two weeks (March 27)! 2. Elvis impersonators. We’ve got wall-to-wall Elvis in this one. Fat Elvises filling jumpsuits like sausage casings at a high school reunion. A hunky, bad-boy Elvis impersonator and a sweet, petite aspiring Elvis tribute artist. And a dead Elvis impersonator-minister who leaves mama and Earl in the lurch at the altar. I’m from Memphis, so plotting the murder of an Elvis impersonator had been a longtime dream of mine. 4. My “research” trip to Vegas. Hubs and I had fun, but I really did check out all the locations used in the book. And I annoyed bus drivers, bartenders and desk clerks with nosy questions. While Liv and Di and the gang end up staying in a fictionalized hotel/casino (because of some of the nefarious goings-on), most of the locations mentioned are real places. 5. The screaming pink cover. I admit, I was a little overwhelmed by the pinkness of the cover when I first saw the art. In fact, I described it to my agent as bordello pink. (FULL DISCLOSURE: I may have used a word other than bordello.) But, my agent, editor, and husband loved it immediately. It is very Vegas. And it’s grown on me. It’s actually one of my favorite Liv & Di covers now. Can you single out a favorite or fun book you’ve read—or written? Maybe one that you ended up liking a lot more than you though you would like based on the title, cover art, or cover copy? Share in the comments. Tags: Elvis, Las Vegas, writers life. Bookmark the permalink. Sounds like a hoot, Vickie! Sure to be a big hit. Congrats, Vickie. The cover is indeed very Vegas! Ha, thanks, Hestia! I would like a return trip to Vegas when hubs and I have more time. Maybe even a Vegas-style renewal of vows — who knows?! Sounds like a lot of fun. I have some catching up to do on your series, but I’ll look forward to getting to this one. I LOVE the hot pink, Vickie–and the couch car, lol! As to favorite book I’ve written – it’s whatever I’m trying to sell at the time! I love that cover, and this book sounds like so much fun! And like Ellen, my favorite book is usually the one I just finished writing. In this case, it’s my own Vegas-based cozy mystery that comes out in July. My memory is horrible, so I doubt I can even remember what happens in some of my early books! Love this post, Vickie. And what a blast you had. Thanks for sharing. It’s inspiring. Honestly, I wish ALL of my covers were that pink. Pink rules. Especially hot pink. Thanks, Cynthia. Set your next book in Reno — you’re going there anyway! Can’t wait to see you and the rest of the Chicks at Left Coast Crime next week! Vickie, loved this–you are definitely in charge of the Chicks’ social calendar in Reno for Left Coast Crime! I have a very pink cover also for FASHIONABLY LATE, but I did write a whole pink-condo scene in CARDIAC ARREST. I called it “Pepto Bismol Pink”–but “bordello” is soooo much better! Ha, thanks, Lisa — our books are in the pink! That bachelorette party was great but my favorite thing about the book, besides the characters that I already love was meeting Little Junior. I was thrilled when we first encountered him (how stereotype can you get?) but I should have trusted you. He is one of the best secondary characters I have encountered in ages. All round fun book; my favorite of the series and I love the series. Aw, thanks, Jeanie. Day made!